The all new Tiger 800 is a dynamic Adventure motorcycle designed to deliver whatever you want no matter how you ride. On road or off, the new Tiger’s manners, riding position, handling and responsive engine give the rider everything required to enjoy every ride. 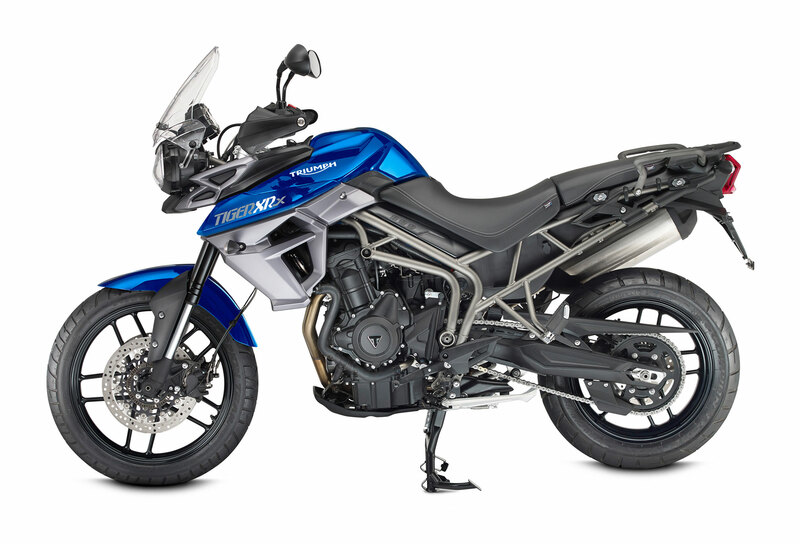 The new Tiger 800 comes in two guises. The Tiger 800 XR is more focussed to the world of road riding whereas the Tiger 800 XC has a more off-road intent. Both models have high levels of standard equipment in a range that now includes 4 derivatives with range topping x models. The XRx and XCx bring more technology to the segment offering the rider a range of standard equipment designed to match their purpose. The introduction of a full Ride by Wire system that interacts with the ECU opens up a whole new level of technology. 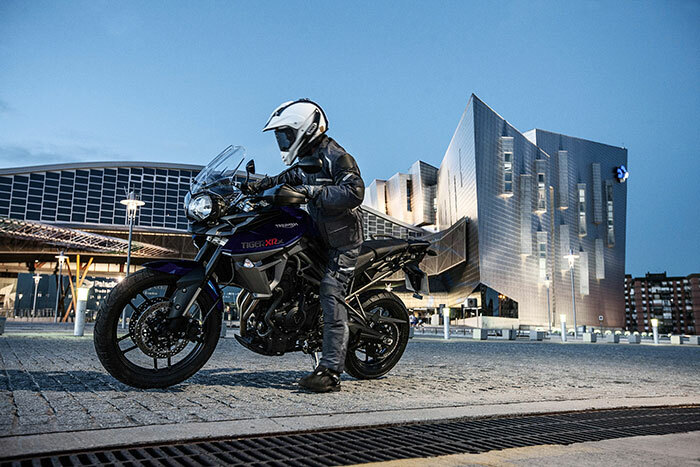 With the inclusion of advanced ABS, traction control, selectable throttle maps, programmable rider modes, and cruise control, the new Tiger 800 leads the segment as a technological tour de force and adds new levels of active safety. The switchable ABS system is standard on all Tiger 800 models and uses the latest technology to prevent wheel lock-up, ensuring maximum confidence and control in any road conditions. On the XR and XC models, the ABS can be turned On or Off. Riders on the XRx or the XCx can further customise their preferences for the ABS settings via the bikes three advanced Riding Modes. When the Off Road mode is selected, the ABS is disabled to the rear wheel and the system also allows a level of front wheel slip. This provides the rider with a level of electronic intervention under braking whilst optimizing their off road enjoyment. Triumph’s Traction Control (TTC) system is standard across all models. This feature prevents the unexpected spinning of the rear wheel, cutting the engine torque to avoid the loss of lateral grip ensuring maximum confidence and control both on or off road. The rider can select their TTC setting to either On or Off on the XR and XC models. The higher specification ‘x’ versions provide Road, Off-Road, or Off settings. In the Off-Road mode, the traction control system allows increased rear wheel slip compared to the Road mode. Riders can configure their traction control preferences in conjunction with the 3 Rider Mode settings. With a choice of 4 different throttle maps on the XRx and XCx models, riders can select the optimum setting to meet both riding and weather conditions. The throttle maps can easily be changed via the switch cube to provide greater levels of control to meet changing conditions. ” The Rain map reduces the throttle response to suit wet and slippery situations. ” The Sport map offers a sharper and quicker response with less throttle twist required. ” The Off-Road map provides the optimal throttle response to face dirt tracks and unpaved terrains, perfect to suit the off-road attitude of the new Tigers. ” OFF ROAD SETTING – automatically sets the ABS, Traction Control, and Throttle Map to “OFF-ROAD” therefore reducing the ABS and traction control intervention allowing for a level of slip. Traction Control, and a choice of 4 x Throttle Maps independently. As an added safety measure, should the rider select a mode that requires ABS or Traction Control to be disabled, then the rider must come to a stop and push the mode button and these features will be deactivated. The new Tiger 800 is the first bike in the middleweight adventure sector to offer cruise control. It is standard on the XRx and XCx models, thus making light work of those enjoyable long rides, reducing rider fatigue and optimising fuel consumption. 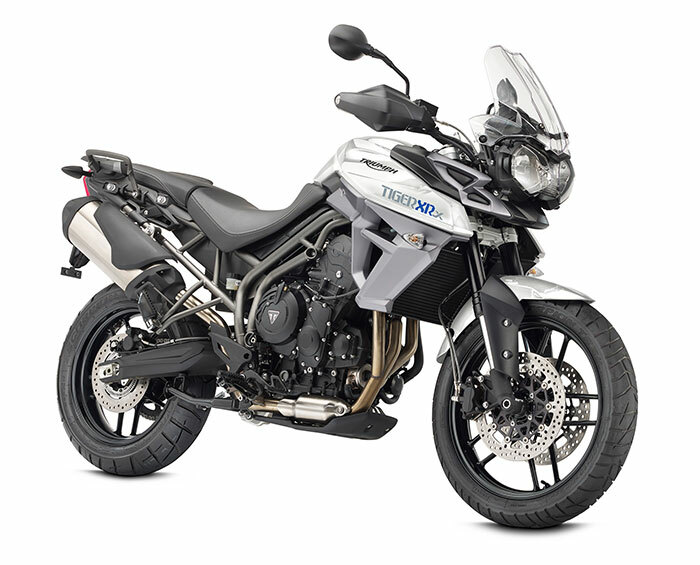 All Tiger 800 models feature trip computers. The range topping ‘x’ models add additional functionality such as journey time, average speed, average fuel economy, range to empty, and instantaneous fuel consumption. The original Tiger 800 redefined what riders should expect from the middleweight Adventure class and the new Tiger has pushed that further. 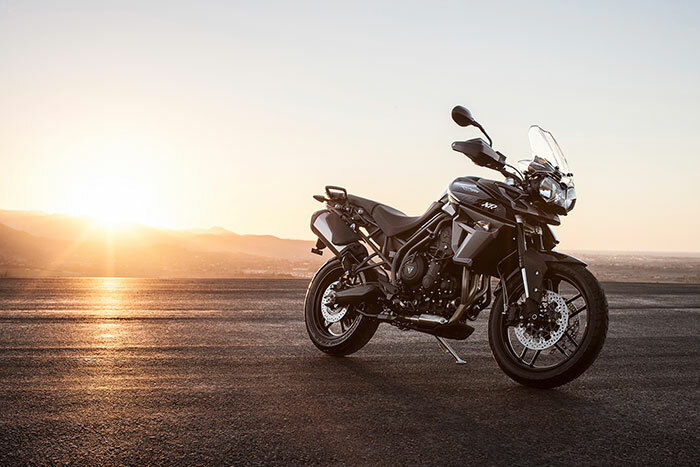 Delivering an even more satisfying, exciting and rewarding ride, the new Tiger is a more comfortable and refined motorcycle with greater fuel efficiency, more agility and improved touring capability for 2015. The Tiger’s 95PS three cylinder engine gives the bike a unique character and sophisticated feel. Inside the engine the raft of changes have reduced mechanical noise and strengthened the premium feel of the triple. The 800cc unit is a rewarding engine that pulls strongly and smoothly from low speeds, delivers a wide spread of mid-range power and still lets the rider use the higher revs, right up to the 10,000rpm limit. Making the most of the engine’s eager character has now been made even easier thanks to a lighter and more precise gear change action, which now uses parts from Triumph’s class-leading Daytona 675 supersport bike. Fuel consumption has been hugely improved – up by 17% on the “mixed use” cycle (European GTR2 test cycle) to 65mpg, and given the 19 L fuel tank capacity it now has a potential range of 272 miles to a dry tank meaning longer riding between stops. This is a 50 miles improvement per full tank of fuel over the outgoing Tiger 800. The new Tiger has a class-leading chassis which translates to outstanding handling on the road, and increased capability off road. 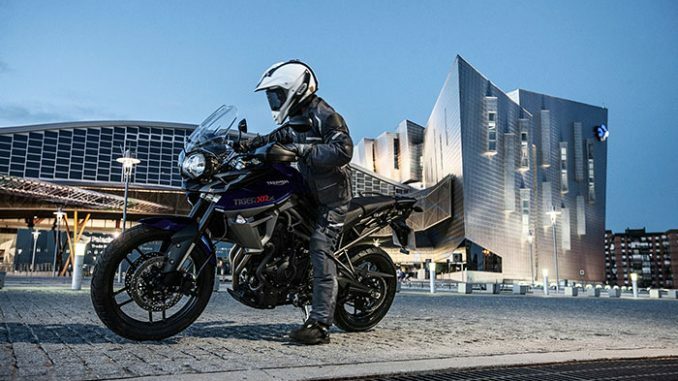 The Tiger gives plenty of feedback to the rider and has high stability and neutrality, putting the bike exactly where the rider wants it to be on both smooth and uneven surfaces. The XR models are fitted with Showa suspension, calibrated to ensure excellent handling on any surface. The front suspension is a 43 mm Showa USD fork, now anodised black. The rear suspension includes a Showa mono-shock which is preload adjustable, allowing easy adjustment and flexibility to tailor the suspension setting to meet the requirements of every journey, be it a spirited solo ride or a comfortable two-up with panniers adventure. WP suspension has been used to further boost the Off-Road riding qualities of the new XC models. The WP 43mm USD fork, with rebound and compression damping is easily adjustable through dedicated clickers on the fork tops. The rear suspension unit is a WP mono shock adjustable for preload and rebound damping and has a dedicated dirt protector for the RSU body. The wheels emphasize the different personalities of the XR and XC models. The new Tiger XR is fitted with light-weight cast aluminium wheels, 17-inch diameter at the rear and 19-inch at the front, measuring 4.25 and 2.5 inches in width respectively, they ensure superb handling and stability. The XC models feature spoked wheels for superior durability on rough terrain: 17-inch diameter at the rear with 4.25 inches in width and off-road oriented 21-inch diameter at the front with 2.5 inches in width. The new Tiger 800 has been given a new look with a new radiator shroud and tank side panels that have sharp lines and taut surfaces. The new bodywork gives the bike a more prone, dynamic stance but the styling isn’t all just about cosmetic gain, the Tiger’s fuel tank styling also ducts hot air from the engine away from the rider’s legs. 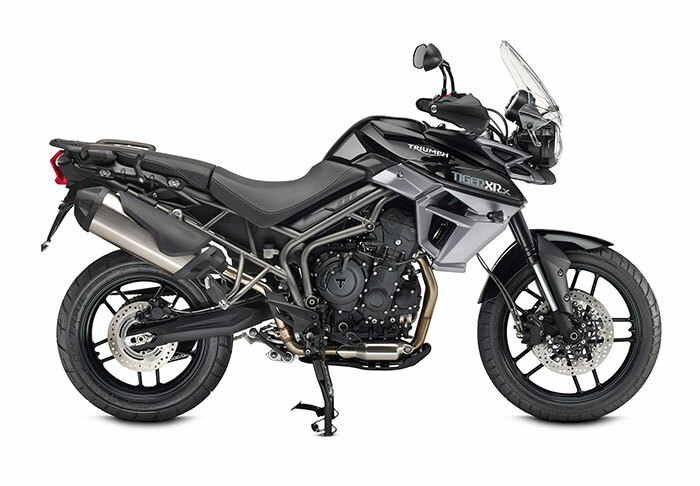 The new “Titanium” powder coat finish on the double-tube frame highlights the rugged looks of the frame whilst the semi-matt finish on the engine combined with the bike’s black wheels and handlebars gives the new Tiger a sophisticated, premium look. Practical touches are plentiful. Alongside the adjustable rider seat height and handlebar position the bike gets a large-for-the-class 19 litre fuel tank, a quick-adjust headlight angle lever for 2-up riding, an Auxiliary power socket near the ignition switch and an aluminium sump guard as standard on all models. Comfort has been improved with both versions getting changes in geometry designed to reduce weight on the wrists and to increase leg room. With both bikes also having adjustable seats and handlebars, the rider has the most comfortable and adaptable riding position in the class. Weather protection has been improved whilst riding thanks to the combination of the new bodywork which keeps the iconic Triumph ‘raised shoulder’ profile and the new fly screen. On the XRx and XCx the screen is adjustable without tools with the x models also receiving newly-designed hand guards to increase rider protection. An extensive range of Triumph Genuine Accessories for the New Tiger has been developed to provide a multitude of options to make it your own. New slim line heated grips, a 3D mesh Low Comfort Seat and an all new Tri-Tour aluminium structured luggage system are just three of the comprehensive range of 70 accessories available. There is also the option of five newly created accessory packs offering riders a choice of Sport, Comfort, Touring, Protection, or Luggage packs. The new Tiger range will be available in Triumph stores from Spring 2015.